Looking for meeting notes? They are on the meetings and materials webpage and on the themes webpage. Hi there,I check your new stuff named “Nurturing our community | 2020 Buzz” like every week.Your humoristic style is witty, keep doing what you’re doing! And you can look our website about powerful love spells. 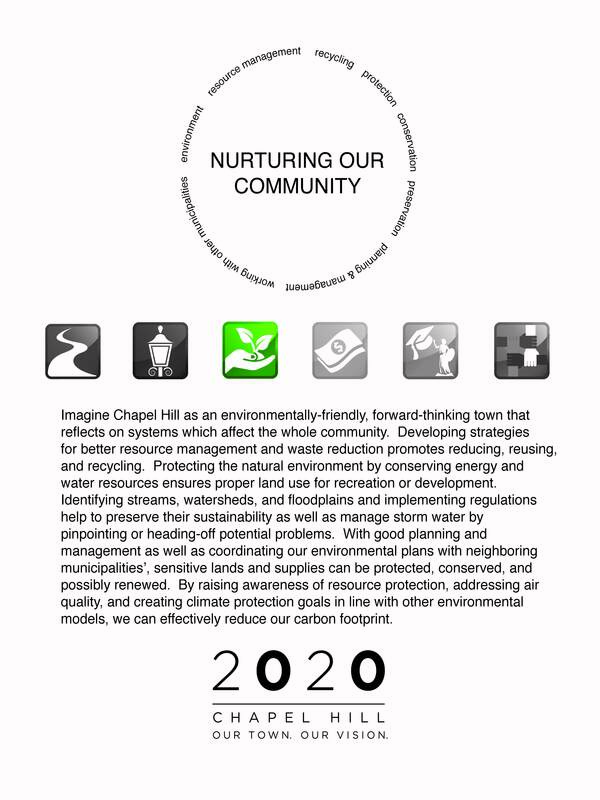 I want the Town of Chapel Hill to hire a water resource policeman, an environmental planner, and a environmental/water monitor. I have spoken with several of our good people in local government besides more than a dozen residents, only to confirm that Chapel Hill does not have anybody doing these jobs so as a result enforcement of water and environmental ordinances, laws, rules and regulations DOES NOT HAPPEN! One item we have not addressed in our discussions is impervious surface ratios for new development. The present standards for residential may be fine, but a loophole in the present ordinance regarding commercial allows 70% impervious, far too high for healthy creeks and good water quality. Goal 1: Ultimate goal: Reduce and dispose of community’s our own solid waste. Strategies: 1) implement a waste to energy system, 2) continue progress on recycling goals, 3) encourage citizens to minimize the production of waste materials through pay as you throw and education. A big discussion on this one. Topics covered included: 1) need to separate collection from disposal; 2) some questioned if our goal to take care of our own waste is feasible, 3) clarifed we will work with partners; 4) pay as you throw concept added; and 5) Public Works Director announced Chapel Hill has issued an RFP to look at solid waste options. Strategies: 1) Conserve land near streams (include forested buffers), 2) plan for functional habitat systems and combat invasive species; 3) implement strict stormwater reduction regulations and incentives, 4) monitor water quality, and 5) implement storm water measures to address and manage current and future problems; 6) showcase yard programs that practice good watershed practices. Goal 3: Protect, acquire and maintain natural spaces green spaces for parks, greenways, entranceways, in order to protect wildlife corridors and to provide recreation and connections to schools. Goal 4: Maintain a review process that is fair, transparent and encourages a sustainable process outcome. Strategies: 1) Integrate environmental protection measures into development review; 2) Includes impacts on neighborhood; 3) Ensure that administrative rules (which by-pass development review) meet minimum standards and include an appeals process; 4) Evaluate all projects through a “sustainability filter”. See link. http://olympiawa.gov/community/sustainability/sustainability-and-sam-a-decision-making-tool.aspx. John Richardson with the town is familiar with this and said they actually use this for all town decisions including something like buying boots for the sewage department. Strategies: 1) Create and deliver education programs for use in a variety of community venues including schools; 2) Offer non-regulatory incentives for hydrologic practices that go beyond minimum standards: Develop programs for new development that encourage natural landscaping, and for existing yards that employ rain gardens and proper management of storm water. Suggestion was made to make education a component of every goal and to eliminate this one. Strategies: 1) offer incentives for green buildings with town as example, 2) measures during development review that will reduce heat island effects, 3) green space preservation, 4) and other actions that reduce greenhouse gas production. Goal 7: Nurture sustainable agriculture and local food production. Suggested Goal 10: Conserve and enhance special character of neighborhoods. Here are responses to requests I received on Jan 12. Reposted as this wasn’t posted when I first sent it late Jan. Streams and waterbodies are not turned on by default on this map. To see them, turn on the “Hydrology Classifications” layer in the Map Contents on the left. To see things more clearly it helps to turn off some of the other layers. There was a request for a map of hydrology as well. Sadly, I don’t have any maps that print out well at 8.5” x 11” (or are small enough to email) that have any amount of detail. I (or Julie McClintock) will bring our large “Find Your Watershed” map to the next event that shows stream names, street names, and our administrative watershed boundaries. I also have a request for the group that will improve Town staff’s ability to work towards agreed-upon goals. I’m probably opening a can of worms to bring these issues up as I’m sure this will ignite considerable discussion and make you feel like you haven’t gotten anywhere! In any case, those of us in the Stormwater Division (and probably others) have tried to gauge our level of effort or target for success against what’s written in the existing Comprehensive Plan. However, the way things are written it’s difficult to know when you’ve achieved success. My request is that you write your goals so they have some specific milestone or point that signifies you’re meeting this goal. Focus less on steps to get to this goal, and more on what you want Chapel Hill to look like/operate in 2020. Such specifics allow staff to estimate costs and resources needed, evaluate feasibility, identify trade-offs and conflicts, and map out implementation. All of these are parts of evaluating sustainability. I have added an item I failed to include when I posted the goals on my last post a few days ago.. This is item 9 under Goal 2. It refers to protecting wellhead areas for households that use ground water. I will make sure this idea does not get lost in the shuffle. Perhaps individuals would be interested in becoming ‘stewards’ of a particular goal? A steward could make sure the goal and strategies represent the concerns of the entire group. She or he could facilitate discussion of it during meetings etc. I’d sign up for the water goal… I could open a dialog with the person who has been emphasizing buffers and work with others who have ideas to add to the goal or to refine the ideas. Another question, are we going to try to prioritize these goals? Goal 3: Protect, acquire, and maintain natural spaces green spaces for parks, greenways, entranceways, in order to protect wildlife corridors, provide recreation and improve access and connections to schools and other community assets. Strategies: 1) Integrate environmental protection measures into development review; 2) Includes impacts on neighborhood; 3) Ensure that administrative rules (which by-pass development review) meet minimum standards and include an appeals process; 4) Evaluate all projects through a “sustainability filter”. See link.
. John Richardson with the town is familiar with this and said they actually use this for all town decisions including something like buying boots for the sewage department. Blair Pollack from Orange County Solid Waste Management was in attendance at the January 12 meeting and he noted that the waste-to-energy technologies are not yet ready for prime time. Plus, they will require a regional partnership since Chapel Hill alone does not have sufficient waste to justify the cost. I suggest that we remove specific solutions, such as waste to energy, from our goal statements and stick with the goals we want to achieve rather than the means by which they are achieved. This is the link to SAM: http://olympiawa.gov/community/sustainability/sustainability-and-sam-a-decision-making-tool.aspx. John Richardson with the town is familiar with this and said they actually use this for all town decisions including something like buying boots for the sewage department. green spaces, natural spaces, (personally, either works for me we should decide on which terms is most appropriate).. I would like to see 75foot conservation buffers on both sides of creeks and streams. I would also like to see ponds and lakes preserved. WCHL is reporting that Chapel Hill is going to pull out of its solid waste management partnership with Orange County when the landfill closes. If that were to occur, it would mean trucks going directly to Durham County instead of to a transfer station in Orange County. I would like to know if the analysis on this decision included looking at the carbon footprint involved? I also don’t understand why is the town making such a significant decision while we are in the process of developing the comprehensive plan. The siting issues and capitalization and risk are daunting. This is not to say that waste to energy is not to be considered a possible ‘solution’ but to recognize that it is inherently contradictory to any strategy that is focused on reducing and recycling waste. The market value of paper and plastic (the highest heat content materials in our waste) has been steadily increasing. The amount of paper overall is beginning to decline as the paperless office finally begins to become a reality, at least on the private side. So investing in a waste to energy plant may preclude a very aggressive waste reduction/recycling program. Suffice it to say that when our local landfill closes we will pay considerably more to haul waste 90 to 100 miles to the nearest private landfills that are most likely to readily accept it. There are closer publicly owned landfills but they have not shown much interest in accepting our waste. Chapel Hill now is the only community in NC with 68 gallon waste carts; all the rest have 90+ gallon carts and weekly waste collection. The 68 gallon cart is enough if you recycle, compost and reduce, for almost all but the very largest of households. If you ride some routes on collection day, you will see some carts (I est. 10% doing this a few years ago) with an extra bag of garbage sitting on top. If the Town were to charge for only those extra bags, not for what fits in the cart, they might reduce their waste another healthy increment and create a recycling incentive that could be self financing on the cost of the bag About 6000 communities in the US have a version of pay by the bag or the pound for residential waste and most have noted a reduction in the waste stream once these programs are implemented. . I attending the last Dec 1 theme group 2020 session and I’ve studied the latest list of goals (which is posted here). I think the table captures some, but not all, of what we put forward in our December 1 discussion. While I would expect this list of goals to remain fluid for while, I believe some changes are needed to reflect where the theme group is to date. I’d like to see the group agree on the final list of goals so we can move on to implementation and strategies. It sounds like the Thursday Report Out meeting (tomorrow) will allow additional time for discussion in the theme groups. In an effort to move things along, I’ve taken a stab at a rewrite of the goals which I think are closer to what we identified in our discussion. Please compare my list with the posted file below and see what you think. I’m sure we need additional group discussion to reach consensus on a list. – Design and implement waste to energy systems with our partners (including Orange County and UNC) to reduce and dispose of our own solid waste. Continue recycling programs to meet waste reduction goals. – Maintain and improve water quality by protecting watersheds through monitoring, incentives, regulation, conserving land near streams, and implementing storm water measures addressing current and future problems. – Protect and acquire green spaces for recreation (greenways), connectivity and habitat preservation. – Integrate environmental protection measures, e.g. habitat and watershed protection, into development review. – Raise community awareness for the benefits of resource protection through education and incentives. Offer non-regulatory incentives for developments that go beyond minimum standards. – Develop local measures to address climate change and lower our carbon footprint, including offering incentives for green buildings, reduced heat island effects, green space preservation, and other actions that reduce greenhouse gas production. – Nurture sustainable agriculture and local food. The ‘goal’ statement does not address renewable energy explicitly only obliquely in its last sentence on reducing carbon footprint.. While the Town has made several notable efforts on incorporating renewable energy like solar hot water on public buildings e,g, the old bus garage there is a lot more need for on site photovoltaics and solar hot water systems as well as super efficient buildings. We also have to learn to maintain the systems we do put in! The Town should investigate ways to enable the financing of the renewable energy and conservation retrofits or at least defer any property tax implications from these type improvement. The financing of such systems especially retrofits could be integrated into a low interest loan pool payable when properties are sold. I am aware that the Town is dabbling in some of these areas now along w using biodiesel in some vehicles, etc. The whole concept of the municipality pushing renewable energy options forward can be made stronger and more urgent along with the resources to help residents and businesses readily adopt the technologies. 1) I want Food-Aid International to work out of free/donated office space, preferrably along Legion Road, in the office building right behind the SunTrust bank [along 15/501 South], or in the Blue Cross Blue Shield Building [also along 15/501 North] or enough financial donations from the community to pay all of our monthly rent at any of those same locations. I also want the community to volunteer to pack the bags and, potentially, take the bags overseas to Haiti and other places around the world. Executive Director Food-Aid International, Inc. I want to see people come out of the woodwork and donate all sorts of money to the chapel hill parks and rec to purchase real uniforms for all sports teams (including little league baseball all-star team), fix/repair fields (like baseball fields), gyms, etc, purchase new sports equipment, and even pay for peoples salaries (like me) to coach year round (football, baseball, basketball, etc) and turn chapel hill into a real sports town. We need to focus much of our attention on the importance of the Carolina North development. This will be, without doubt, the single largest project in the town’s history. How will the surrounding area change? Will there be adequate density zoned for the area to maximize its potential? How will it affect roadways to the area, most especially Estes Drive? These and many more questions require that we spend a good amount of time on the project – but I see little mention of htis specific item in any documentation thus far. The big concepts for Carolina North have already been negotiated. Check our Carolina North Agreement on Town web page. Undoubtedly the campus will have a big impact on transit and congestion in northern Chapel Hill. Yes we have the Jordan Lake rules coming down the pike. I missed the first meeting but I’d like to see the Town do an all around better job of protecting our creeks.